Hampton Water Gardens, a division of Danner Manufacturing, provides pond owners with a full line of effective, efficient and long lasting water pumps for ponds, water features, fountains and statuary. All Hampton Water Gardens pumps are built to last, with the most durable components and most efficient running systems available. Danner Manufacturing has built a history of excellence in the aquarium and pond industry since 1934, producing innovative and effective products for aquatic professionals and hobbysists alike. Danner aquarium and pond products are industry leaders across the board, and many of the brands currently regarded as the top of the line for water care fall under the Danner Manufacturing umbrella, including Pondmaster, Supreme and ProLine. 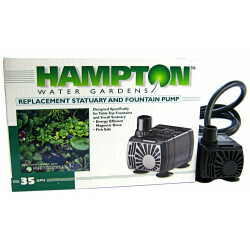 Be sure to browse all of our Hampton Water Gardens pet products to make sure you find just the right powerful, efficient pump for your pond, water garden or fountain. Pet Mountain is pleased to be a leading vendor of great Hampton Water Gardens pet products. Pet Mountain is proud to offer you a wide selection of Hampton Water Gardens pet products, at the very best prices available anywhere! Take a look at all of our huge selection of great deals! Can't find something you're looking for? Let us know! We'd love to help. Be sure to check out our online coupons and discount shipping on all your favorite products.